The world's only wall-mount medicine cabinet with no mirror and a picture frame door! Designed to hang on most any wall, The Picture Perfect Medicine Cabinet adds storage and style to any room! The perfect solution for renters who can't cut holes in their walls or homeowners with plumbing or electrical obstructions in theirs. You insert your own photographs or prints and change them as often as you like! The Large Caramel Picture Perfect Medicine Cabinet features our flat profile frame and is stained a classic brown inside and out, making it the perfect choice for traditional homes. 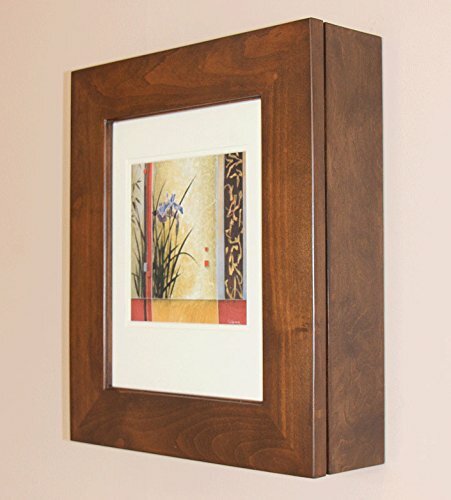 Mounts on your wall in minutes and holds up to 11" x 14" artwork from your personal collection. If you have any questions about this product by The Concealed Cabinet by iinnovators, contact us by completing and submitting the form below. If you are looking for a specif part number, please include it with your message.